How do your teeth look when you smile in the mirror? Are they bright white and sparkling or has their luster dimmed a bit in recent years. Whether your teeth are becoming more yellow as a part of the natural aging process or they have staining caused by foods and beverages like cola, tea, coffee, chocolate, and curry, you don’t have to feel self-conscious about your teeth any longer. 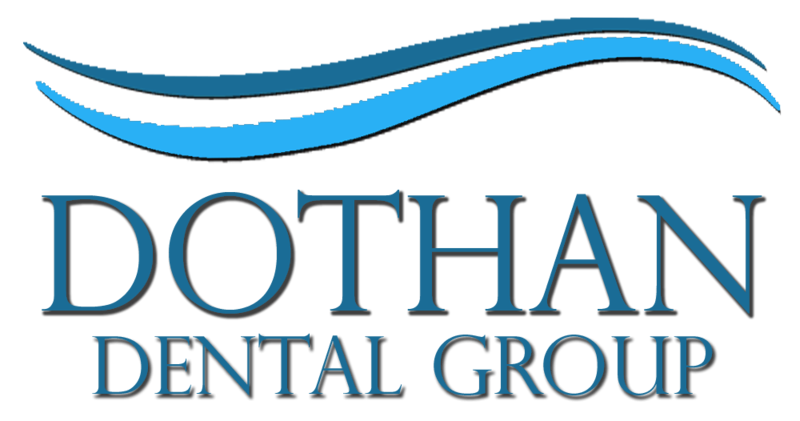 At Dothan Dental Group, we offer both in-office teeth whitening and professional take-home teeth whitening kits to give you back your pearly whites. Our whitening treatments can take years off your smile, removed stains caused by food or tobacco, and can even remove discoloration caused by certain medications. We use the Zoom II in-office teeth whitening system. This system provides incredible results in just a short amount of time, making it perfect for anyone who wants to up the wattage of their smile in time for a special event (like a wedding or job interview). The system is completely customizable so that you get the exact amount of whitening you want and also includes an added desensitizer so that even people with sensitive teeth can have their teeth whitened. In just a single office visit, your teeth can actually be up to eight shades whiter – a remarkable difference. If you’d prefer to whiten your teeth in the comfort and privacy of your own home, we offer customized take-home whitening kits. Not only will you receive a tray that is created from a model of your teeth so you know it fits perfectly and comfortably, we also offer a range of strengths to meet your whitening needs. The product is easy to use and, like our in-office treatment, contains a desensitizer so you can whiten comfortably. The entire process takes only about one to two weeks and can be done on your schedule. If you’d like to find out more about teeth whitening and whether it’s right for you, just give us a call to schedule your teeth whitening consultation with either Dr. Ashley C. Matthews or Dr. T. Wayne Prim. We’ll examine your teeth and discuss your habits to determine the cause of your staining and the effectiveness of teeth whitening for your particular discoloration issue. In some cases, teeth whitening may not be the most effective route to whiter teeth, and we can discuss other options with you as well. There’s no question that over-the-counter teeth whitening kits are a big-selling product… and that’s the entire problem. Because they are sold in mass, they are designed to be “one size fits all.” And nobody’s mouth is exactly the same. Additionally, the products provide little protection for sensitive soft tissue in the mouth, and the system takes a much longer time for less impressive results. Not to mention that you won’t have your trusted dentist handy if you have a question! Call Dothan Dental Group today to schedule your teeth whitening consultation. In just two weeks, you could have beautiful white teeth once again!